Are you sure you really ever had cancer? Under observation. 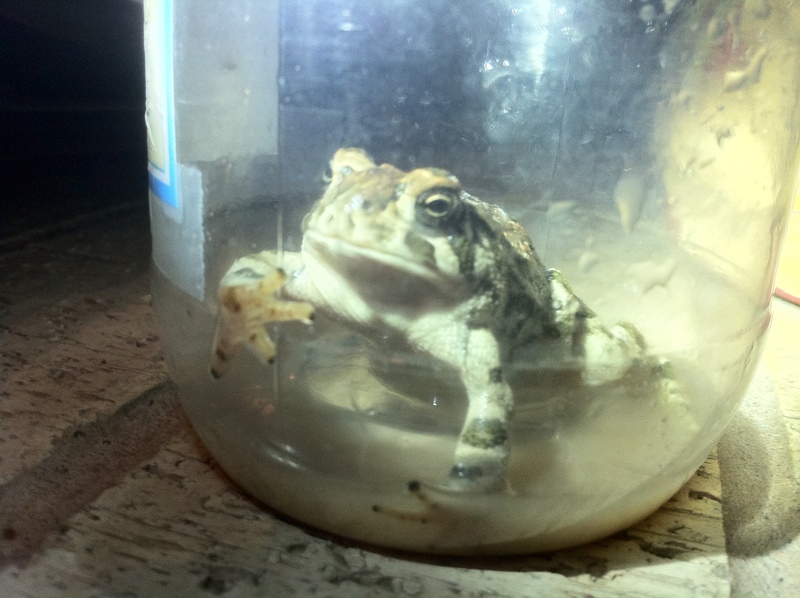 Are you Sure this is Really a Toad? As I approach the anniversary of my diagnosis I have been reflecting on how far I have come. This post is perhaps a bit more in the realm of venting than usual. Details of my western medical treatments and their aftermath, along with the effects of impertinent questions. Read at your own risk. I will have my last Herceptin infusion in three weeks, and after that will be on a much reduced monitoring schedule with my western doctors- blood tests every three months, scans every six months- and of course tamoxifin daily for 4 1/2 more years. If I am still “cancer free” after 5 years I will be on the best possible end of the bell curve. No guarantees of course. As I look back I have been thinking about what parts have been the hardest for me to deal with. I do this not to wallow in it, but to get clear, reframe if needed and move forward more lightly. I don’t want to be retelling the hard bits next year, or in ten years. Like a label on a jar I want to rub at the sticky hard bits and wear them away from my memory. In this I have help from an unexpected direction, side effects from two aspects of my western treatments are actually helping me out. Memories of the difficulties of the chemo treatments are quite vague. A surprising benefit of my chemo brain. Who knew that having two neurotoxic chemo drugs would have an added benefit besides knocking out all dividing cells? This chemo induced vagueness was added to by the anesthesia induced vagueness, which makes the time spent recovering from surgery a bit soft focus as well. What is memorable and outstanding in all of this is the amazing amounts of love and support that surrounded me. What is memorable and sticky are some difficult things that people have asked me. Questions that have really spent a lot of time rolling around in my head. And yes, the two largest tumors looked like they were either perilously close to or actually involved with my chest wall- which made me not a good candidate for immediate surgery. Which is why I received 6 sessions of chemo and targeted therapies prior to surgery. My oncologist wanted to enroll me in a post surgery clinical trial with more chemo to help maximize my chances of survival. Even though an MRI the day before my last chemo infusion showed that several tumors were gone- the seriousness and the known aggressiveness of my original diagnosis did not make me a candidate for breast conserving surgery. No lumpectomy for me- it wasn’t even considered. That the post surgery pathology came back totally clear was a Big surprise for my doctors. That the pathology doctor was so certain that my sample was cancer free, certain enough that he restaged me from stage 3C to stage Zero is very uncommon. Uncommon enough that my surgeon presented my case at a conference last summer. I have a lot of demons about believing I am never sick enough for it to “count.” As if I have some report card going to God as to how well I measure up to standards. Demons about being a hypochondriac- despite having none of the symptoms of a hypochondriac, ironically. These inner demons probably contributed greatly to my not seeking medical attention during the 4 years that I was having serious symptoms of something being very wrong in my body prior to my official cancer diagnosis last year. The people who asked me if I really ever had cancer probably were just processing their surprise- they probably have no idea that it was just the sort of reality invalidation that really pushes a lot of buttons for me personally. They probably have no idea of the negative impact of their impertinent words. I have come to the place where I can see that their words provided me with the opportunity to slay some of my dragons- I mean if you can ask a one breasted bald woman if she really had cancer, you are probably the one who needs a bit of a reality check-in. The sheer absurdity of it helped me to see that ultimately I am the only one that can validate my own experience. Thinking of their question in terms of the “We-are-all-One” universe, that question was just a mirror being held up. A gift, or opportunity to help me wrestle with my demons. After thinking about this one, I have to say Yes. I did start cancering to get attention, but probably not the kind of attention they imagined. I actively ignored, and willed away a fairly huge list of warning signs sent to me by my body for at least four years prior to my diagnosis. I would indeed say that my body started cancering because I wasn’t giving my body enough attention and self care. I am guessing that my happiness and gratitude during my treatment provided some cognitive dissonance to these questioners. What could I possibly have to be happy about? I have heard both of my children respond to the question of how it was for them to be going through my treatment year. In Sam’s words “Ironically this wasn’t as bad as I thought it would be, she was actually much sicker during the black year.” Sam started referring to 2010 as the “black year” because it was the year our family was under extreme stress, and I spent a lot of time being very sick and very unavailable. Back in 2010 my body was seriously knocked off equilibrium, something was really wrong. I was still trying to pull myself up by the bootstraps and just “get over it”. Well meaning friends suggested that my severe fatigue could be mitigated with just a bit more exercise – out of touch with the fact that I sometimes started to black out after climbing the stairs in my house. After a lifetime of maintaining a very stable weight, I gained over 20 pounds. My digestion was off kilter. I had reoccurring low grade fevers, achy joints, migraines, sore throats and a hacking cough most mornings – sometimes coughing so hard I retched. I periodically had vertigo so bad I had to spend days in bed. My sleep was horrible and I woke up feeling like I had been hit by a truck. The lymph glands in my neck swelled up until the were visible- like those pop up turkey thermometers. Layered over all of it was absolutely crushing fatigue. A thousand shades of fatigue- I learned to describe the nuances of it like Inuits describe snow. What I didn’t have was any kind of diagnosis. What I didn’t have was any sort of official validation of my experience. I was sure that at least half of my coworkers thought it was all in my head. I thought if I just tried to eat better, and sleep a bit more it would all just go away – like a bad cold. Only it wasn’t a bad cold, I was trying to operate normally with only about 25% of my prior energy. Probably I was already cancering. By early 2013 I had become much better at managing the fatigue, and was up to maybe 60% of what feels normal- but I still felt like there was something wrong. I was beginning to suspect I might be cancering. I had returned to working production shifts at the bakery. I had learned to treat my body like a loan shark- I was on a no credit plan. No “borrowing” energy from the future. I became a disciplined miser of my personal energy and made the most of every watt, which were still in limited supply. In May of 2013 I dreamt that I had cancer. I spent the summer coming to terms with the reality of possibly having cancer. By the time I went to the doctor in November I was just seeking confirmation, and treatment options. So was I really so desperate for attention that I imagined the whole thing? Is it possible that the pathology reports were wrong? Did I not really have tumors the size of my fist? I now believe these questions represents a strange phenomena within our society to be rational at all costs. To the point of being irrational. From my perspective I am living in the land of miracles. This is not rational perhaps- after all I benefited from the most advanced western treatments available for my particular molecular cancering dance form. I also benefited from the ancient wisdom of Traditional Chinese Medicine, wisdom gained from over 3,000 years of observation. So probably my experience is not qualifiable as a miracle, even though I did surprise my oncologist and surgeon. On the other hand I think that hundreds of people offered prayers on my behalf, and I find myself surrounded by improbable serendipity all the time which points towards divine grace. 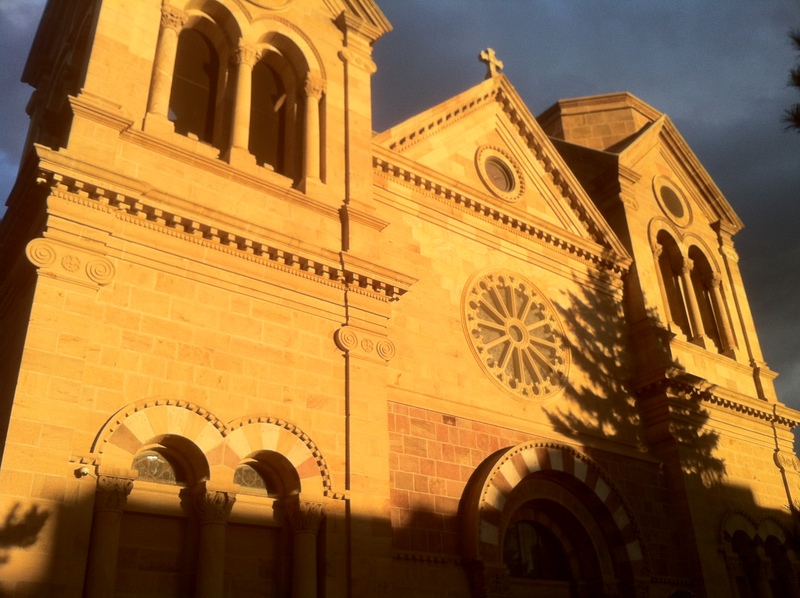 Saint Francis Cathedral Basilica Santa fe. If Cancering was a call from my body for attention, then these questions were a call to action. That call to action is to stop looking for permission to have my experience. Ultimately I am the only expert that counts. And I say that Yes, I really did have cancer, and Yes I used story and magic and western medicine to treat it, and Yes I did receive a miracle. Can I just say BRAVO! and also thank you, while I don’t claim to understand what dealing with cancer is like, I totally struggle with self care and needing permission or validation from others to have my experiences be valid to me. To see someone rise up and claim their own makes me want to keep on growing, knowing that it is indeed possible. I’ve learned to think that people are just trying to make us — and themselves — feel as positive as possible about a situation they can’t control and wish weren’t true, a diagnosis of life-threatening cancer. When people tell me I look good, I typically will say, “I need a t-shirt that reads, ‘I wish I felt as good as I look. '” I have a sense of not being taken seriously, of my struggle being dismissed. But the truth is that I try to look as good, and as well, as I can most of the time. I usually make my struggle as matter-of-fact and as private as I can, as you seem to have done until it became impossible. So I can’t blame people for not knowing what I am going though or the past things I’ve suffered, most of them because of chemo side-effects, which have been numerous and profound. My temperament is to suffer alone and lend support to others (deflect attention from myself) when I feel relatively good. Speaking of which, I take the most umbrage when it’s stated or inferred that I have cancer because of a need for attention, or because it’s internalized and unexpressed anger, or because I didn’t take care of myself well enough, or because I don’t like myself. After a twinge of defensiveness, I quickly revert to realizing the silliness and absurdity of the ideas, given much evidence, especially in our individual cases, to the contrary. And thank you for your bravery and strength in facing cancer and in addressing difficulties you’ve had in some of the problematic responses you’ve gotten for this most unwanted condition. With much love and much respect. I should add – I celebrated my ten-years-in-remission moment a few weeks ago…it will be a good day when you are there! Hard for people to wrap their head around a miracle. I am so grateful you had one. Sorry to hear about your black year.